that the precincts are a sanctuary to all living things. The monastery is entered by a large square court. Monks and nuns there grow their own vegetables. Figures of the eighteen (buddha) lohans mounted on dragons and tigers accent fountains of rockery in the center. The main building is L shaped, with two storeys, the upper serving as dormitories for the priests and nuns. The temple in the center of the principal block bears the incscription, Jook Lum Chan Yuan, Bamboo Forest Hall of Contemplation. The two sides of the Temple are decorated with highly colored frescoes of the Eigtheen Buddhas, also called Lohans or Arhats. 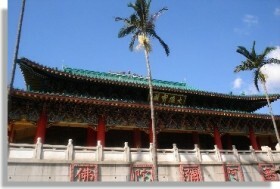 A shrine to Kuan Kung, Patron Saint of martial artists, exist in the south-west corner of the Temple. 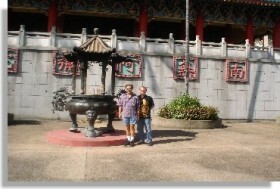 Today, the Bamboo Forest Temple is major tourist attraction in Hong Kong listed on tourism routes. 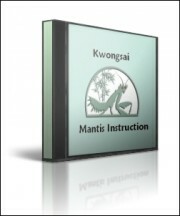 Discover the Secrets of China's Jook Lum Temples and mantis, including photos and video - click here now! Note: Photo right - RDH and Sibok Jesse Eng, Lam Sang's first generation disciple lived together with Lam Sifu and six other disciples for several years in the 1950s NYC.